Quite a few hair care products this month. With the shorter hair, I have to give it a bit more attention otherwise I'm a doppleganger for Hermoine Book 1. I received this Klorane Dry Shampoo in my January Birchbox and have been loving it for giving my hair more volume and a fresh feeling. The spray action on this is quite intense, and the white powder absorbs quickly. I have been using a straightener much more than I used to (probably not as much as I did in high school though...) so using a thermal protectant is a must. The Organix Brazilian Keratin Therapy Flat Iron Spray smells amazing and is affordable. To set my style, I have been using the No. 4 Mighty Hair Spray. It doesn't leave my hair crunchy and keeps my hair in place all day. Nail favourites this month include: American Apparel Nail Polish in Hunter and Julep Ta Da! Quick Dry Drops. You can see AA Hunter in action here. It's a gorgeous true deep green. I basically use the Julep Ta Da! Drops with every mani. I love how it speeds up the drying process and moisturizes your cuticles. This next favourite will come as no surprise. Urban Decay Naked 3 has been my go-to palette this month. I am in love with all the rosey shades. I won't go into too much detail as I have 1, 2, 3, 4 posts dedicated to it...Along with this palette, I have been using the UD 24/7 Glide-On Eye Pencil in Demolition, Zero, & Rockstar. Zero is always on my tightline, and I use Demolition, a dark cool toned brown, or Rockstar, a deep purple, on my waterline. 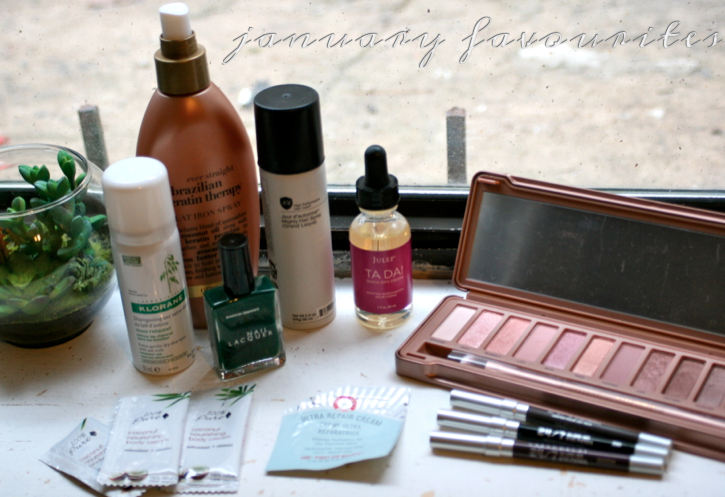 It's rare that foil samples make it into favourites, but I discovered a couple of products that I had to mention. 100% Pure Nourishing Coconut Lotion was in my Birchbox this month and though I was disappointed in the packaging-the product is great. It smells like toasted coconut and is super creamy. Perfect beauty fix for the freezing winter. The First Aid Beauty Ultra Repair Cream was another winter must this month. A no-frills face moisturizer that worked well both at night and in the day under make-up. I will definitely have to pick up a full-size next time I stop by Sephora. Continuing with the winter moisturizing trend, I have been loving the Bath & Body Works Warm Vanilla Sugar Creamy Body Wash and The Body Shop Almond Nail and Hand Cream. Both products smell amazing and are great hydrators. the best hair treatment ever, in my humble opinion, is the pro naturals moroccan argan oil. It has completely restored my hair to its original, naturally balanced appearance and shine! I will definitely have to check that out! Thanks for the rec!